This is the most important layering piece. It is worn against the skin and wicks moisture. A critical element to staying dry and warm. A must for all wading conditions. 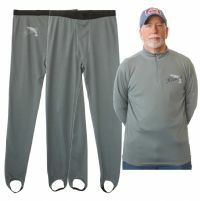 Our zip-top is lightweight odor resistant, treated polyester material. It wicks moisture from your skin. The zip-top allow you to vent to control temperature. 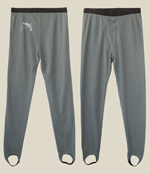 Kiene's lightweight bottoms has elastic waistband and front opening. These maybe one of the only lightweight bottoms that have foot straps to keep them from riding up the leg. That alone makes them great for fly fishers. Great quality, great features with exceptional prices. This is about 30% less than comparable underwear with fewer features. Money Back if not satisfied.